We expect over 50 J/24s this year. Sign up now and join the fun! 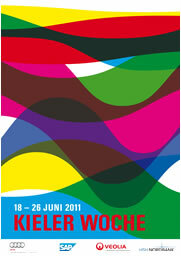 This year’s Kieler Woche will be more modern than ever (18 to 26 June 2011). It will include a debut for two skiff classes and a comeback for two catamaran classes on the Kiel Fjord. This shows the immediate reaction of the persons resonsible for the Kieler Woche on the decision of the International Sailing Federation ISAF on Friday, 12 November, to re-include the catamarans in the Olympic Games in Rio de Janeiro (2016), since their exclusion for 2012. Also the A-class catamarans will reappear at the Kieler Woche. The single-handed doublehulls were already present in 2001 in front of Schilksee. The decision to sail the next America’s Cup with multihulls also stimulates the one design class, since the A-class catamarans already served as a model for the past AC in February 2010. Even today, AC aspirants gain experience riding on these narrow hulls. Up to 30 A-class catamarans are expected to race together with the F18s and Hobies for the international part of the Kieler Woche (23 to 26 June). The Musto Performance Skiffs (MPS) will show up in Kiel for the first time. But the premiere will be also a homecoming for the single-handed skiffs with spectacular trapeze and gennaker setup. The concept of the racy class originates from Dr. Joachim Harpprecht from Molfsee (close to Kiel). His construction from 1999 enjoys great popularity in England, where the MPS is built, 200 of them have already been sold. In the past years, the skiff also became more popular in Germany, now counting 50 owners. Among them, Catharina Gauda, who is responsible of the event organisation for the MPS class at the Kieler Woche. „We expect a major international participance. We already received notice from starters from the UK, Norway and the Netherlands“, says Gauda, who is one of the few women in the class. With the German Open and the Europe Cup, the Kieler Woche will be the MPS highlight in the upcoming season. There is another skiff class having its first big performance at the Kieler Woche 2011. The 29erXXs’ ambition is to be the class for the recently nominated discipline High Performance of the women. Derived from the juvenile skiff, with a larger rig, this class is still developing. Jobst Richter would be satisfied with 10 entries: “We will definitely be open for the innovative classes at the Kieler Woche and keep them in the program permanently, when they have proven their value“, says Richter. Regatta Dates Kieler Woche 2011: 18 to 26 June.